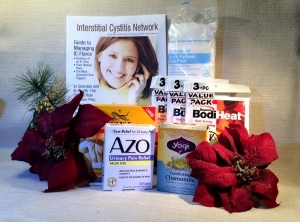 What couldn’t be a more perfect gift than products that can provide comfort during IC flares. We’ve assembled some of our best products that can and will help! Sometimes you just need something sweet, right? What can a patient enjoy and not trigger an IC flare? A close cousin to chocolate, carob candy is FABULOUS! It’s rich, flavorful and satisfying. Really? Really! We’ve assembled our favorite sweet treats in this lovely candy sampler, a perfect gift for an IC patient who needs (no, deserves) a treat! Queen Bee English Toffee (5 count) – thick pieces of crunchy, buttery caramel coated in rich carob and fresh roasted almonds. 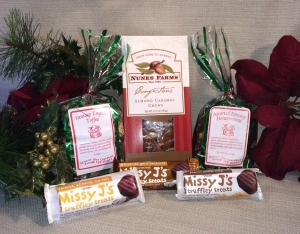 These are an ICN office favorite and make a wonderful Christmas or holiday treat! Queen Bee Honeymoons (8 oz.) – Honeymoons are basically “turtles” with a soft, buttery caramel center, roasted pecans and then coated with a layer of carob so rich and flavorful that you’ll be looking at the package and wondering why it’s not Godiva! Nune’s Farms Almond Caramel Chews (6.5 oz.) – A popular IC treat, these are bladder friendly and perfect for an after dinner sweet! 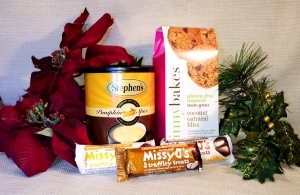 Missy J’s Truffley Treats (1.38 oz.) – This bite size candies pack plenty of flavor. We’ll thrown in three for a delectable surprise for your taste buds! Coffee lovers rejoice! if you’re a desperate for a cup of coffee and have a tender bladder, what can you do? Try a low-acid coffee! Simpatico coffee is the best low acid coffee that we’ve found. It received excellent reviews in an independent, blinded low acid coffee test and has a fabulous, rich flavor profile. 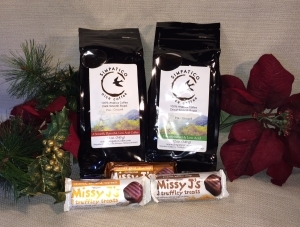 We’re throwing in both a regular and decaf for your tasting pleasure along with bites of the perfect candy, Missy J’s! This is the PERFECT gift for any IC’er who is struggling to drink regular coffee. Here’s a a fun selection of bladder friendly cookies, white hot chocolate and mouth watering carob truffles, perfect after a snow fight or if you just want to curl up with a book by the fire!